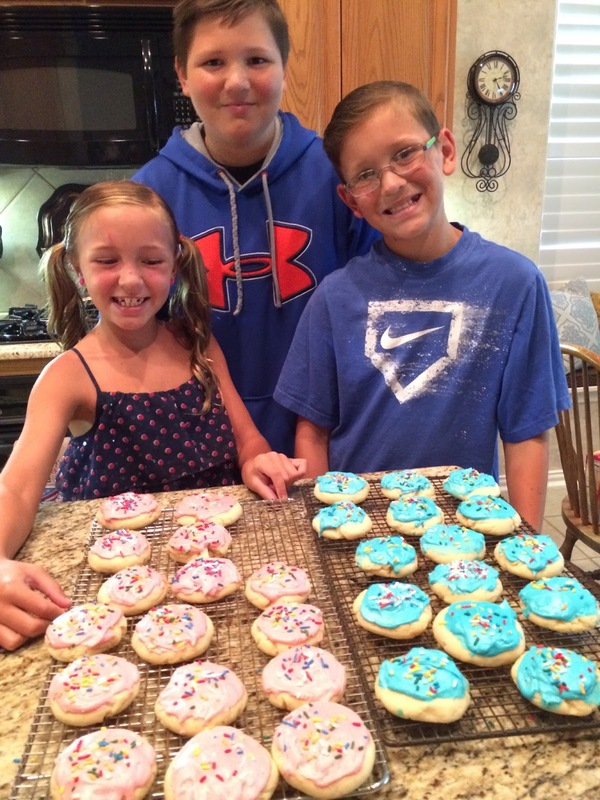 Three of my grands and I decided to make our very favorite soft sugar cookies. When I mentioned the name of the cookies, they all said, "yeah"!! The daisies in my lady vase are from my garden. They're a special variety that do well in Texas. I started with three plants and now I have a whole row of them. Doesn't this pretty teacup that my sister gave me, look perfect with the cookies? I think so, too! Don't the kids look proud with their bakery cookies? Yes, we get sprinkles all over, but it's so worth it. The dough for these cookies chills for an hour, which gives us time to play several rounds of Uno. You can see how the kids have grown from this post. I'm sharing the recipe again, in case you'd like to make some big, or little kids happy! On June 30th my Mom celebrated her 87th birthday and my sister and I took her to a restaurant that had the most beautiful patio, with a waterfall, and all these gorgeous flowers and plants. My Mom is always coordinated from head to toe, and always has on a pretty belt, too. You can see that she wore pretty yellow sandals in the above photo. Your mom looks beautiful. I can't believe she is 87; she looks amazing. Those soft frosted sugar cookies look yummy. No wonder your grandkids love hanging out at their nana's place. 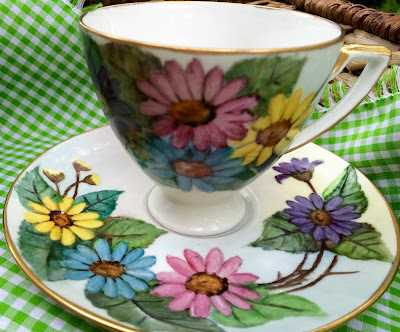 Pretty tea cup....love the daisy pattern. Sweets for the sweet Kitty, your cookie choice for baking with your grands had to be their favorite, you can't beat a big frosted cookie with sprinkles! Happy birthday to your fashionista mom! Your grands sure have grown. Such a cute place setting with the yummy cookies. Your Mom is just adorable and I love her outfit. Happy Birthday to her!! Oh, what wouldn't I give for a plate of those right now!!! And that tea cup is just lovely. Kitty your mom is so cute! I'm glad she got to spend her birthday with you and your sister in such a pretty place! The cookies look so yummy. I'm pinning this recipe! Kitty, your Nana Cooking Camp is a precious idea. I know your grands love it! The cookies look delicious. I lost all my daisy plants several years ago when we had nonstop rain one spring and summer. I need to try them again. Your lady vase made me smile. I had one, but recently sent it to a friend in Tyler who is now collecting them. Fun idea! Your mom looks terrific. I love her colorful outfit. Have a great week. What a fun day with the children. I could be in your mom's club as I will be 87 neat month. She still has a lot of pride and that is good. Your Mother looks darling and so well coordinated indeed. I see cooking camp is in full session again and I give them all an A+. The cookies look delicious! Thanks for sharing and linking. A belated happy BD to your mom, love how she's dressed with coordinating accessories. You're the best nana to have baking/cooking/craft camps and those cookies look yummy! Kitty, I think Nana's Cooking Camp is such a good idea and sounds like so much fun!! I'm sure the cookies are delish! :-D Wow, those grands have definitely grown a lot! I love the teacup from your sister -- did your lady vase come from Ireland? Your mom looks so fashionable, Kitty, and the restaurant patio looks lovely. I'm glad you and your sister were able to be there for her 87th birthday. Take care and have a great week! What a beautiful mom and sis! I see where you get your looks from. I love your Nana's cooking school. Those grands are learning a valuable skill, and a tasty one. Hello Kitty, the grands must love your cooking camp! How lucky they are. :) The cookies look great and I love the frosting and sprinkles! Happy birthday to your mom! You all look so fashionable!! What a special day with your Mother and sister! A great way to celebrate an elegant lady's birthday! Cookies with Nana -- a big hit. They are making my mouth water! Your mom looks sweet! I love her style! boy, those cookies look great--I love sugar cookies, especially frosted or glazed. I have a pineapple cookie cutter that I am dying to try out too!!! How nice that you got to spend some time with your mom and sister....you have a beautiful family Kitty! enjoy your week! What a special Nana you are, Kitty. Your little ones must love visiting with you. Your mom looks wonderful and Happy Birthday to her! I had to laugh when you said she's always coordinated because so am I. My mother always was too when she was well and able to dress herself. My mother will be 87 on her next birthday too. Those frosted cookies look yummy. Thank you for sharing and have a lovely week, my friend. HAPPY BIRTHDAY TO YOUR MOM! Kitty, she is just lovely and I know she was a fashion girl all of her life, just look at how she dresses! I just love her. You are so fortunate to have her with you. I lost my dear momma when she was 65. Cookies are always a treat here too, only mine are not so pretty. But, it is always fun making them with little hands helping. Love the teacup from you sweet sister, perfect with the vase and flowers. Love the cross stitch too. Happy week dear Kitty……..
Hi Kitty, Oh what fun at your Nana's cooking camp. The grands are adorable and made the most delicious cookies. Sugar cookies are a real favorite here too. Love the sprinkles to go with those proud smiles of joy. Your tea cup is adorable and what a special gift from your sister. Love your daisies and how great they multiplied to a row of them in your garden. The cross stitch on your table is beautiful!! 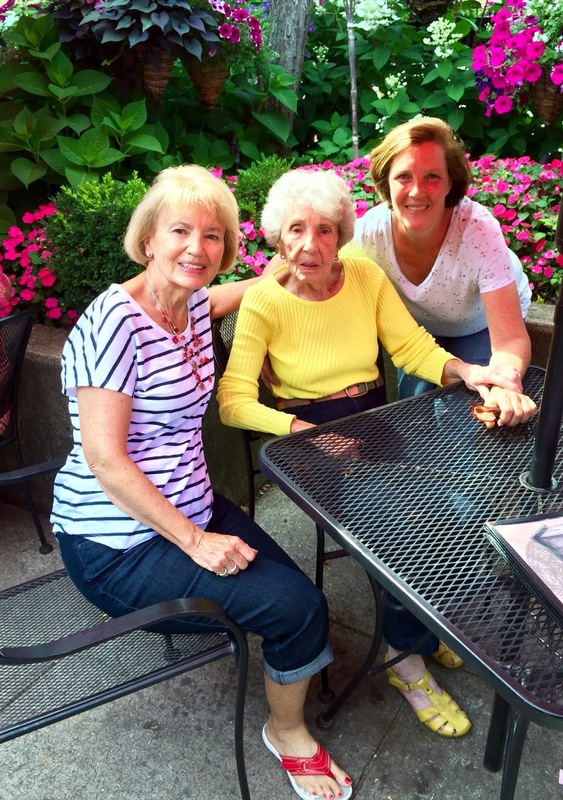 Love seeing the pic of your mom on her 87th birthday with your pretty girls. God Bless your mother!! She is a lovely lady. Love her darling yellow shoes and pretty belt! So glad you got to celebrate at a wonderful restaurant together. Wishing you a wonderful new week. Stay cool! Your mom is so pretty! I wish that I knew how to dress as stylishly! I see that the grands have not grown out of their love for a good cookie...they sure have grown...yet they are just as cute as evah! Well I was so smitten by your mom that I paid no attention to the cookies! Those look just like my grands’ favorites. I’ll have to try them for their birthdays in January. Hi Kitty...and another wonderful baking day with the kids! I know what cookies those are a hack for! Hard to resist! So glad you were able to send your Mom's birthday together. Thanks for linking to Tuesday Cuppa Tea! Give me some sugar, Kitty! How wonderful that you were able to celebrate your mom's birthday with her and capture a sweet family photo. I love her yellow sandals! Wonderful post, Kitty. I love seeing your mother looking so great, and so sassy in her cute coordination. Your grands look to be thoroughly cooking camp. Kitty, I noticed the yellow shoes right away. Your mom is so stylish! I wish her many more birthdays! I love that you do a cooking camp with your grands. I'd love to make these cookies for Xavier when he gets a little older. Very sweet photo of your Mom, sister & you! 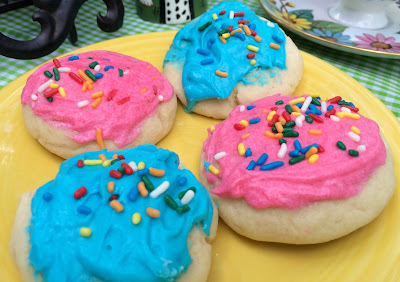 I love soft sugar cookies! I want to come to your home and have a cookie or 2! Your grands love to come to Nana's I know. Happy Birthday to your Mom! She looks fabulous and so stylish. I know you cherish time with her. Those are my husband's favorite cookie !!!! They sure do look yummy !!!! Your cookies look amazing, my friend. They look like the ones my husband, son, and I love to splurge on from the grocery store - you know, the extra soft and sweet ones. I would much rather make homemade so I will have to try your recipe soon. Also, I so enjoyed reading your post about meeting Bonnie. What a joy! She is such a sweet blogger and it looks like the three of you had a blessed time. I love the way you style your cookies. And the grans look adorable. What many blessings you have in your life, Kitty. Your precious Mother, sister, children and these darling grands! I love, love seeing a family celebrate life together and your cookies are one of the best ways to do it! Your mom looks fantastic! The years have been very kind to her, and she wears her age very well. The cookies look delish, and I love that they are soft. My husband prefers crunchy sugar cookies. He says they make better dunkers. But I like my cookies soft. Such a pretty teacup. Gorgeous, vibrant colors. Awww, special memories with both your Mom, your sister & your Grandkidlets! Such Fun! 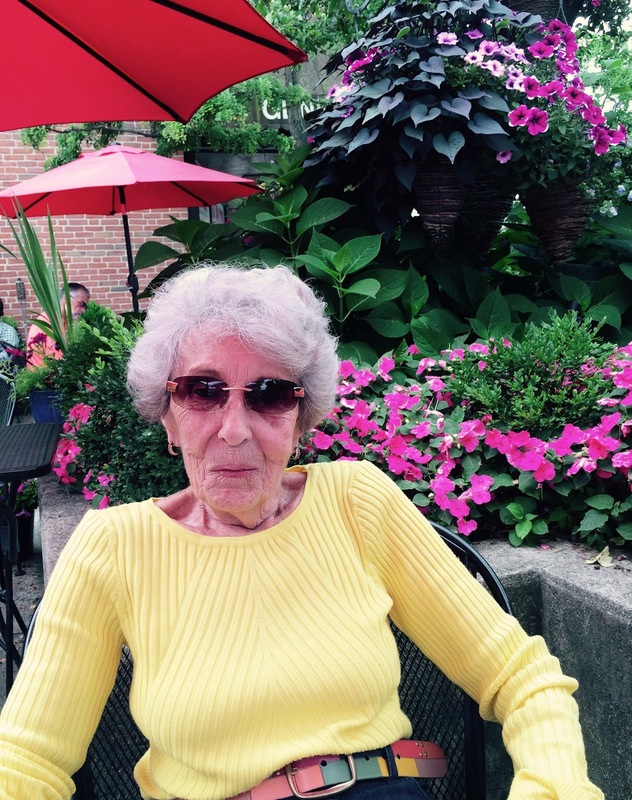 Mom looks great for 87...amazing woman. 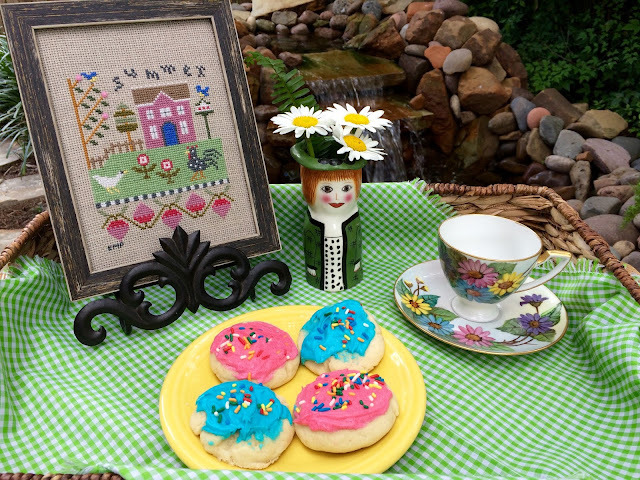 Pretty cookies, fun times with adorable grandchildren and celebrating your mom makes this a very sweet post! Yes, your grandkids have grown! I looked back at that previous post. Think of all those memories being made. They will sustain them for a lifetime. The teacup looks so pretty with those cookies. I'd Love to have a couple right now, but am having chicken and broccoli for lunch. Have to fit into that MOB dress! Thanks so much for sharing this sweetness with us at TOHOT! Kitty, you have had some very special days. Those cookies look amazing along with your grandkids. Just love the idea of Nana Camp! The cookies would be great with a cup of coffee in the morning or right now with iced tea! I know the grands love this Nana Camp ~ such special memories. The tea cup & saucer are gorgeous. I love daisies ~ one of my favorite flowers! Oh Kitty, your Mom looks so pretty and it is easy to see that you belong to her. The precious faces of your grand babies make those cookies the best ever. You are having so much fun! I really appreciate you sharing with us at Full Plate Thursday and hope you have a great weekend! When I left my other comment, I had never noticed the needlework "summer" picture - that is sooooo cute. I have to tell you that I am off today to go antiquing with 2 other bloggers: Gina at Victorian Wanna Be and Janice at Curtains in My Tree. I am excited! Hope your weekend is great but don't eat to many of those cookies! Ha! These looks so amazing and I can't wait to try them with my girl. Thank you for sharing at Dishing it and Digging it link party. We love having you. Have lovely week.